‘The food is just out of the world’ . Quite a few guests started asking the hosts Mr Vasanth in the recently concluded 60th birthday celebrations. Mr. Vasanth mentioned Pranaya Weddings and introduced a few of them to me towards the end of the function. Client’s Uncle Mr.kumar said – ‘Very impressed by the variety of dishes. Never before have I seen such varieties in a party before’. 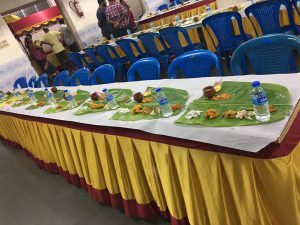 As we thanked the guest for the compliment, Mrs Usha added ‘Usually there is a compromise between quantity/variety and quality’, but all dishes were tasty and that to me is something great. That pomegranate and capsicum curd pachidi was the pick of the lot for me’. Mr.kumar immediately added ‘I felt the corn carrot curry was unique and tasty’. Thanked both of them and handed over our visiting cards when they requested for the same. ‘Oh, so you do overall event management?’ remarked the Mrs.Usha on seeing the card. ‘I was assuming that you just took care of food’. Our host immediately replied ‘As I was telling you, they helped us plan the overall event. Right from hall booking to decorations inside, cake selection and arrangement, everything was taken care. But today the dinner impressed everyone and so people are enquiring just about the catering part. All along I thought menu was simple and easy to decide. I was at a complete loss for the choices they offered and was confused but they guided us by picking the right choice too. It was completely hassle free and I could relax all along’. Yet another instance where we could delight our customers.